After leaving Egypt, and crossing the Red Sea, the Israelites arrived in the Wilderness of Sinai. It was really more like a desert, with very little food or water. God, in His Mercy, supplied the children of Israel with literal bread from Heaven, a substance called manna that smelled like “coriander seeds” and looked like bdellium. Every night, this manna would supernaturally rain down from Heaven to feed the Israelites while they journeyed through the Wilderness. As we described in our previous post, the Israelites arrived at Mt. Sinai, where Moses went up the Mountain to obtain the Ten commandments. The Ten Commandments were written in stone by the finger of God, and given to Moses to share with the Israelites. Most people are somewhat familiar with the ten commandments. These have been the backbone of many Western Nations, whose laws are often based on them. The ten commandments can be divided two sections, four commandments that show us how to relate to our Creator and six commandments that show us how to relate to each other. Jesus later boils these ten commandments down into two commandments. “Love the Lord God with all your heart, mind, soul, and strength, and love your neighbor as yourself”. God entered into a Covenant with Israel at Mt. Sinai, known as the Mosaic Covenant, or the Covenant of the Law. The idea behind this Covenant was that if Israel obeyed God, then they would receive great blessings. God would protect them from enemies, He would bless the works of their hands, etc. If they disobeyed the Covenant, then bad things would happen to them. They would be given over to their enemies, they would experience famine and pestilence, and things like that. Ultimately, the worst punishment would be exile from the Promised Land. Along with the ten commandments, God gave Israel 613 Oral laws, that were later written in the Torah, and the blueprints to build the Tabernacle. The written and oral laws were to help Israel set up a thriving society that would keep them in communion with God and each other. These laws also included the animal sacrifices (for the forgiveness of sin), that we discussed earlier. The Tabernacle was basically a very special tent that housed the ten commandments (written on stone), and some other very important items (Ark of the Covenant, Golden Menorah, Table of Shew bread). The idea was that God would dwell in the Tabernacle with the Children of Israel. God’s desire was to be near His people, but their sin had made it so that God had to set up some very strict boundaries or else they would perish in His presence. The Plan for the Hebrew people, that had been promised to their forefathers centuries earlier, was for God to eventually lead them into the “Promised Land“. God Almighty had promised Israel, through the Patriarchs (Abraham, Isaac, Jacob) this land made of “milk and honey”. It was a good land, and God Almighty was giving it to the Hebrew people. When the Israelites arrived at Kadesh Barnea, which bordered the Promised Land of Canaan, they sent 12 spies to spy out the land for 40 days. When the spies returned, ten of the spies gave Israel a “bad report”. They told Moses that there were terrible GIANTS in the land, fierce and HUGE! They described themselves as “grasshoppers” in comparison to these huge giants. The Israelites DID NOT TRUST that God would help them defeat these literal giants. However, there were 2 spies who believed that God could defeat these giants. God was not happy with Israel’s lack of trust (especially after they had just witnessed so many miracles), so their punishment was that they would “wander in the wilderness” for forty years before God would LEAD THEM into the Promised Land. And, that’s exactly what happened. God took up residence in the newly built Tabernacle. 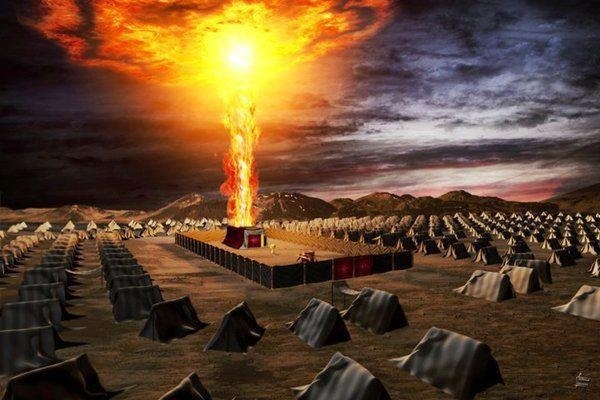 God appeared to the Israelites as a cloud of Glory over the Tabernacle. He lead them through the wilderness as a pillar of cloud in the day, and a pillar of fire in the night. The pillar of cloud sheltered them from the daytime desert heat, and the pillar of fire warmed them during the frozen desert nights. When the cloud moved, the Israelites were to follow. When the cloud stayed, the Israelites were to stay. Jewish writings state that the Israelites’ shoes and clothes never wore out, even after wandering in the wilderness for forty years. God took care of them in the wilderness with manna (bread) that literally rained down from Heaven. He went ahead of them. He protected them. God helped them draw water from the rocks. There are IMPORTANT spiritual applications here in this Old Testament story. We take the Passover when we apply the blood of “the Lamb” (Jesus Christ) over the doorposts of our hearts. This happens when we believe the Gospel (That Jesus died for our sins and that He rose 3 days later, granting us also the ability to rise from the Dead). By receiving Jesus into our hearts, we are ensured that the Angel of Death (Spiritual Death) will Pass over us! After we take the Passover (believe on Jesus the Christ), we receive the GIFT of the Holy Spirit, who guides us out of Egypt (sin/the world), and though our wilderness experience (life on planet earth). Although a harsh and austere place, the wilderness is where we find God. The Pillar of fire/pillar of clouds represent the Holy Spirit’s work in a Believer’s life. Holy Spirit protects us, shields us, comforts us, and guides us during our “wilderness experience” on planet earth. Because of our sin, we are now wandering in the wilderness (aka daily life), but God has not left us to wander aimlessly through the wilderness alone. God is here, and He is guiding us, sheltering us, protecting us and feeding us, through this wilderness experience. Next stop, the Promised Land. Israel was brought into the Promised land after 40 years of wandering in the wilderness. We, too, will be brought into the “Promised Land” after we complete our Wilderness Experience. What is the Promised Land? Well, physically, it was the land of Israel that is now in the Middle East. Actually, the Biblical land of Israel was much larger than the State of Israel today. The Biblical land of Israel is still very important to God, who has given it to the Jewish people. The Bible tells us that “in the last days” Jerusalem would become a cup of Trembling to the whole world (and it has!)!! Spiritually, the Promised Land is the Kingdom of God. Some call it Heaven, and it is. Eventually, Heaven is coming to earth. Yes, Jesus has a plan for this earth, and we are currently in the phase of “wilderness journey”; however, soon and very soon, we will enter the Promised Land.